Before skiing, before sheep herding and before Idaho was even a state, the Wood River Valley enjoyed brief but generous profits from lead and silver mining endeavors near the turn of the 20th century. Like most American developments in the 19th century, the late success of the Wood River Valley’s silver and lead mining boom wasn’t accomplished without widespread oppression of indigenous and minority groups. While mining took off in California and Nevada, the Wood River Valley pioneers were late to the game; the area was uninviting, desolate and teeming with native Bannock and Shoshone tribes. Town namesake John Hailey said local Native Americans created “setbacks” to mining progress. Even recent history books refer to miners’ being deterred in their mission due to “harassment” from the Native American population. Despite finding quartz in the upper Salmon River area, in spring 1878, prospectors led by Levi Smiley were halted by Bannock Indian presence between Challis and their find. While hundreds of Bannocks agreed to live within the confines of the Fort Hall Reservation prior to 1870, disputes over the use of the Great Camas Prairie went unanswered by the governor of Boise in 1878, and many reservation Indians united under Chief Buffalo Horn to raid white settlements. Months later, they were subdued by American military forces and forced into submission following the death of more than 100 Bannock men, women and children in fall 1878. With the Native population generally forced into the substandard reservation lifestyle, mining prospectors had fewer obstacles in the quest to satiate their greed for silver and lead. Discoveries by Smiley and others prompted more expeditions to the area and beyond. In 1879 at the mouth of Gladiator Creek at Galena, prospectors discovered veins of silver thicker than 2 feet, with up to 60 percent lead content and silver ore worth $80 to $120 per ton. By 1881, the Wood River Mining District was based in Galena to encompass the myriad of camps that popped up throughout the valley. The year 1880 marked the beginning of smelter plants popping up in the valley. Smelting was a necessary process for lead and silver ore, to decrease rock volume and oxygen levels. Shipping materials for smelter construction was hugely expensive, but the growing profits made the costs worthwhile. The high altitude and harsh winters deterred all but the most hardened of prospectors at the beginning. Though more than 200 claims had been filed in the district by fall 1880, only 27 people remained after the winter. By 1881, the word had gotten out about the valley’s silver deposits, and prospectors came from the west seeking their fortune. 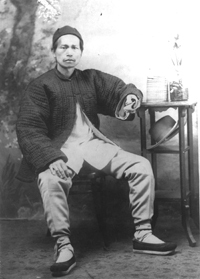 Chinese immigrants also flocked to the area, taking up camp primarily in Bellevue and Hailey. Even after the towns amassed schools, banks and sundry stores, the isolation of the Wood River Valley could still be felt in the early 1880s, when supply lines could be severed by inclement weather. While people could go weeks without news or a letter from the outside world, starvation was staved off by the availability of venison. The Union Pacific Railroad extended tracks into the valley in April 1883, starting with Hailey, and Ketchum’s first train rolled into town a year and a half later. By 1882, there were more than 100,000 Chinese immigrants dispersed throughout western American mining centers. They were faced with immigration cutoffs and acts of violence by the white population, and the attitude of white Wood River Valley residents toward the newcomers was no exception. Chinese women in local camps had few financial opportunities beyond prostitution, and Chinese men labored in supportive jobs, rather than silver mining. Operating stores, restaurants, gambling houses, laundries and farming endeavors, Chinese immigrants encountered few racial troubles in the early mining years, but that changed in 1884 with mass boycotting of Chinese businesses. What was once a bustling community had completely disintegrated by 1890. In a 2010 population census, the Asian population in both Bellevue and Hailey was less than 1 percent. Entrepreneur J.M. Rhodes of New York City used East Coast investments to open the Philadelphia Smelter on the north side of the Big Wood River above Warm Springs Creek. Following a trial run in fall 1881, Rhodes opened the smelter full-time in 1882. He began seeing high profits the following year, after adjusting prices, adding on to the facility and developing business acumen. The smelter had doubled in size in 1883 and featured the first electric lights in the territory of Idaho; furthermore, it was producing 120 to 180 tons daily. Costs associated with production were not cheap; smelting in the 40-ton furnace cost at least $12 per ton. The Philadelphia Smelter worked on ore that came in throughout the Wood River Valley, as its low prices nudged out competition from smaller smelters in Galena, Muldoon and Bellevue. Ore was brought in from the far reaches of the region; freight wagons pulled by 16 mules carried the deposits from mines in Vienna and Sawtooth. Ore coming in from the northern Wood River area traveled by pack train to Galena, then made the rest of the journey to Ketchum by wagon. An entire pack-train load of ore was sent to the Philadelphia Smelter daily from the Blue Jacket Mine, near Boulder Peak, in 1884. Hailey mines generated more than 30 percent of ore received by the smelter in 1883, the proximity to Ketchum making for cheaper transportation costs. It’s difficult to track the smelter’s profits, due to the lack of record-keeping; the federal government didn’t require the mines to report income until 1893. However, a newspaper reported $3 million generated from the Wood River area in 1883, the start of the mining boom in the valley. The Philadelphia Smelter closed in 1893, which historians believe was a response to a reduction in silver prices as well as shipping costs for unrefined ore in the early 1890s. The smelter, once spanning 400 acres and boasting two top-of-the-line furnaces, faded into obscurity. Today, all that remains is a stone wall on Broadway Boulevard. Sources: “For Wood River or Bust: Idaho’s Silver Boom of the 1880s” by Clark C. Spence, and “Sun Valley: An Extraordinary History” by Wendolyn Holland.